This interview is part of a series profiling leaders of the Faith and Reproductive Justice Leadership Institute, a project of the Center for American Progress’s Faith and Progressive Policy Initiative. The Institute provides faith-based leaders working on reproductive justice with training and resources in order to strengthen and raise the visibility of their work. You can learn more about this project here. 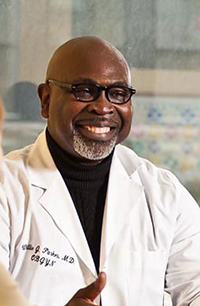 Dr. Willie J. Parker is a reproductive justice advocate and associate medical director of Family Planning Associates in Chicago. He formerly served as medical director of Planned Parenthood of Metropolitan Washington, D.C., and was assistant professor of obstetrics and gynecology in the John A. Burns School of Medicine at the University of Hawaii at Manoa. Parker graduated from Berea College in Kentucky and holds an M.D. from the University of Iowa, as well as a master’s degree from the Harvard School of Public Health and a master’s of science in health services research from the University of Michigan. His work focuses on violence against women, women’s reproductive health and rights, and men’s reproductive health. Sally Steenland: Welcome, Dr. Parker. We’re talking to you today as a doctor, an abortion provider, and a person of faith. I’d like to start off with one of the new anti-abortion bills that would ban abortions at 20 weeks. Thirteen states have already passed these 20-week bans, and last month the U.S. House of Representatives passed a 20-week ban. There are some Republicans in the Senate who want to introduce a 20-week ban as well. Supporters say it’s a reasonable bill—in fact, a compassionate bill—because they claim that fetuses can feel pain at 20 weeks. It seems they may have some support, at least in terms of public opinion. Let’s start with the issue of pain—both the science and the emotions. What do you say to that claim? Willie Parker: Sally, I’ll start with faith. It’s exactly what Daniel Patrick Moynihan said, that everyone’s entitled to their own opinions but no one’s entitled to their own facts. Medicine is based on scientific evidence. It is clear that when we make decisions about health care and medicine, it should be based on science. Religion is protected by our right to have our own religious beliefs, but we’re not entitled to [dictate into law] our opinions on health care. Clearly, the evidence shows no scientific support for the notion that a fetus at 20 weeks can feel pain. In fact, the very structures necessary to carry the stimulus that could be interpreted as pain aren’t even developed until at the end of the 29th week. The notion that a fetus can feel pain is not even viable until about the 30th week, or well into the third trimester. Twenty weeks becomes a very arbitrary number. Pregnancy lasts 40 weeks, so at 20 weeks you’re halfway through the pregnancy. The logic goes: Most women should know and have made up their minds by then [about continuing their pregnancy]. In actuality, 88 percent of women end their pregnancies in the first 12 weeks. I respect the fact that people want to be compassionate and make sure that when we end a pregnancy, the fetus is not suffering—but there is no scientific evidence to suggest that. So the [20-week ban] really becomes an indirect way of conferring personhood on the fetus. As a physician, I feel compassion and will do anything necessary to alleviate pain and suffering. That’s what I do as physician, but there’s no reason to do that in this case. SS: So it’s not that you’re this cruel person. You’re simply telling the truth and saying it’s really important to base medicine on the facts. WP: The majority of women are very thoughtful about their decision to end a pregnancy, and we diagnose pregnancy earlier with new tests. Again, 88 percent of women end their pregnancy, if they’re going to do so, in the first 12 weeks. But the remaining women—the overwhelming majority of those who decide not to continue the pregnancies—are either women who had no idea that they were pregnant or who have health issues that worsened well after they had established that they were going to continue the pregnancy. Or they have devastating news [during] a very-much-desired pregnancy, with a late diagnosis where there is something wrong that is either structural or chemical. We have different types of fetal diagnostic testing. Some of those reveal abnormalities or lethal abnormalities, which aren’t detected until much later. To have an absolute, blanket statement that is simply based on the amount of time that lasts in a pregnancy, there’s a judgment that if a woman has not made up her mind by then, she loses her right to make that very important decision. It’s very arbitrary and in defiance of the fact that there are many diagnoses that aren’t established until much later. The development of a pregnancy is a very dynamic process from start to finish. In fact, some of the more critical development around viability happens around those last four weeks. The pregnancy is growing all the time, but some of the structures, for example, the ability of the lungs to exchange air and CO2—most fetal lungs can’t expand unassisted until after 25 weeks. At 20 weeks, there’s not a pregnancy that, if it were delivered,—either spontaneously or if it were induced—would survive outside the womb. SS: Pull back the curtain: This 20-week ban is cloaked in fetal-pain language and supposed compassion for the woman, but there’s something else behind it. What’s the intent and strategy behind the 20-week ban? WP: It is the recognition that the majority of people still understand that women need the right to have an abortion, either for health reasons or other circumstances. Given that there is no likelihood of banning abortion outright, I think that these strategies represent a more subtle way of trying to parse away at reproductive rights by appealing to what would appear to be logical and reasonable and emotional aspects of reproductive health. We’ve taken the focus off women because when you focus on the health of women, the case is made for abortion. But if you personify the fetus or a pre-viable pregnancy and turn it into a person or baby and then imply that there’s suffering going on—and also imply that the majority of women who have an abortion are doing so out of callous disregard for the life development that’s occurring inside of them—it makes it easier to be unsympathetic or indifferent to the real value of abortion, that is, the value it has for women. The reality is that women are empowered—both morally and intellectually, as well as legally—to make the decision about whether or not to continue a pregnancy. SS: What you just said makes me think that what they’re really doing is pitting women against the fetus. The woman becomes the villain and the fetus is who you have to protect and save. WP: You’re absolutely right. In obstetrics, we call that area where these dilemmas come up “maternal-fetal conflict.” For example, with women who have severe health issues yet have an otherwise viable pregnancy too early in development to survive outside the womb, you’re forced to choose between the woman [and] the pregnancy that she’s carrying. We call that maternal-fetal conflict. But these are false conflicts that are being created. Without the ability to look at these issues in a complex way, people very simplistically say, “Okay, God is in control. If it’s God’s will that both the mother and the baby survive, it’ll be so.” I think you’re entitled to that opinion, but we cannot make health policy based on those kinds of thoughts. SS: You talked about a number of restrictions—and the 20-week ban is one of them—but there are others that require providers to have privileges in hospitals and require clinics to have hallways that are certain widths or have janitor closets. What’s the impact of these restrictions, and does it differ depending on where you live or how economically privileged you are? WP: The impact of these restrictions is huge because it is, in my opinion, an abuse of regulatory authority. Again, in lieu of being able to overturn Roe v. Wade, to arouse the sympathy of a pre-viable fetus by conferring personhood on it—these laws represent a different strategy of hyper-regulation under the premise of making abortion safe. I guess the safest abortion is one that never occurs, but to make it so cumbersome, whether from the doctor’s standpoint or the patient’s, is to make it impractical even when it remains legal. I think part of this has been driven by a perceived window of opportunity regarding what happened with the Kermit Gosnell case. I’d just like to say that, for people to refer to what Dr. Gosnell did in the context of abortion, it would be like referring to Frankenstein in the context of transplant medicine. They have nothing to do with one another. Dr. Gosnell was committing criminal actions in a way that outrages any compassionate and logical person, but these laws represent a strategic way of undermining legal access under the pretense that they are improving safety. These are solutions in search of a problem. There is no problem with abortion. There is no question that abortion is lifesaving. There is no question that it is health care. But they’ve decided to turn it into a problem so they can fix it. They are trying to fix a problem that doesn’t exist. SS: When you talk about hyper-regulation and abuse of regulatory authority, it’s ironic because this is coming from conservatives—and sometimes libertarians—who are always screaming about overregulation. WP: You’re absolutely right. It’s almost really paradoxical. SS: I have heard you be eloquent in talking about why you do the work that you do—why you provide abortion care for women, and it’s because of your faith. Can you connect those two for us? WP: Sally, as I try to describe my path, I would say what someone once said: When you wrestle with your conscience and you lose, you actually win. For me, that wrestle of conscience came from being reared in the South as a fundamentalist Protestant Christian and having those very absolutes that many people hold. And yet as I grew and took my faith more seriously, it became personal to me. In an effort to hold that faith and integrity, I had to reconcile the world that I was beginning to know and understand and my chosen path as a scientist and later as a doctor—how the pathway of science squared up with my understanding of religion, which I consider to be in my own DNA and have had no desire to abandon. Having eventually ended up going to medical school and becoming an OB/GYN, I found myself still wrestling with what it meant to be a person of faith and deal with the dilemmas and complex situations that come up in the context of helping women with unplanned or unwanted pregnancies or very-much-desired but lethally flawed pregnancies. For the first 12 years of my practice, I could not provide abortions. While I never questioned the right of a woman to have them, I felt conflicted about what it meant to provide them. That wrestle for me meant that, early in my practice with unplanned pregnancies for women, either referring them [to another doctor] if I lived in an area where there was abortion care available or simply indicating that I wasn’t in a position to help them, but I never blocked anyone. That eventually became uncomfortable and came to a head when I listened to a sermon by Dr. Martin Luther King Jr., as I do often. He’s been a major influence on my understanding of my life both as a citizen and a person with dignity but also as a person who’s well versed in the faith tradition of Christianity. In the sermon, he talked about the Good Samaritan and basically said that what made the Good Samaritan good was his ability to reverse the question concerned. He talked about a traveler having fallen, and the people passing him asked, “What would happen to me if I stop and help this person?” But the Good Samaritan who stopped and helped the person reversed the question and inquired, “What will happen to this person if I don’t stop to help him?” And that resonated deeply with me as an OB/GYN, seeing women frequently with unplanned and unwanted pregnancies. Whereas many of my colleagues had to become comfortable providing abortions, I grew uncomfortable not providing them because of my faith. For me, it became this conviction of compassion in a spiritual sense of the deepest level of love that you can have for another person, that you can have compassion for their suffering and you can act to relieve it. For me, in my chosen path as a women’s health provider, it meant adding to my practice abortion care along with family planning. This became my calling. SS: It’s good for you to tell that story because those kinds of stories don’t get heard a lot. Thank you for sharing that with us. I want to ask a question about abortion and conflicted Americans. We know from polling that most Americans do want to keep abortion legal, while at the same time many believe it’s wrong. A lot of people support restrictions and think that [abortions] should be harder to get. If you were talking to a typical American who says, “Well, I think it should be legal but, you know, they’re too easy. These restrictions make sense to me,” what would you say? WP: I would say I understand their concern and I understand that it’s hard to envision the morality and the sacredness of the decision. But I would say, “I think your decision to judge harshly women who find themselves in the position of choosing abortion is, in part, in defiance of the reality of why abortions occur.” Abortions come from unplanned, unwanted pregnancies, and the majority of women continue those pregnancies even when they’re unplanned. But I would say the reality is that an abortion is never a goal for anybody who has one. When women make that decision, it is, for them, a deep and critical one. And when that decision is made, we need to make sure there is access to safe and legal abortion. We know that when an abortion is safe and legal, women don’t die. The legality or restrictions on abortion don’t really do anything to affect the number of women who make that choice. Dr. John Sciarra, one of the original sign[ers] of over 100 OB/GYNs in 1972 in anticipation of abortion becoming legal, challenged our colleagues to provide the capacity to provide these services to women. He accurately predicted that, if we do that, the need will be that one in four pregnancies will end in abortions, and that’s actually what the numbers show. A few weeks ago he said that we did not anticipate the backlash of posing abortion as immoral and divorcing it from health care, villainizing women, and criminalizing doctors—or doctors being assassinated. We’re in this position now. But the point he made that I want to echo is that, whether abortions are legal or not, there is no law you can draft that’s going to prevent a woman who’s determined to have an abortion from trying to make that happen. I would say to the voter who might consider himself or herself to be a “values voter” that they look at this and look at abortion as health care. It is preventative care in many ways. The reality is that there are never going to be zero abortions. What we should work toward is what we call “the irreducible minimum,” a public health concept of, given the reality that there is never going to be zero, we have to make sure that abortion reaches that irreducible minimum. We get it down to as low as we can, given the reality that women have unplanned pregnancies and illnesses and that there are lethal anomalies, which is different than saying abortion should be legal and rare. Rare means that, irrespective of the circumstances, abortions aren’t available. We’re making it illegal. Ninety-two percent of people live in a county with no abortion providers. Right now access is very rare. But we should make sure that any woman needing to choose an abortion has access to a safe one. Any woman who wants to be a parent should have the resources she needs to do that. I think that’s the right goal. I would try to move this person from their absolute stance to being more thoughtful about how they feel. They may very well end up in the same place, but I can respect that they end up there after they are extremely thoughtful about all that goes into what makes abortion necessary. SS: Well, and to your point, when you say to get abortions down to as low as we can by providing circumstances for women, that might mean providing a woman who finds herself pregnant who already has children with health care, with affordable child care, with a living wage. All of these things happen in a context of how someone lives, and sometimes a woman is making the best and most responsible decision she can make. But if we want to encourage her to have the child, she needs the supports to raise that child in a healthy way, right? WP: What you just described, Sally, is that new framework that resonates deeply with me. That is reproductive justice. You and I talked about this and have done some work, and you are leading and training people in that aspect. It is the deconstruction of the silo—the framework that you support adoption, you support abortion, you support child care—recognizing that these are all legs on a four-pronged stool. The stool does not stand up sturdily unless all of them are present. SS: That’s exactly right. They’re all linked to each other. SS: For my last question, I want to go back to the religion and science issue we were talking about earlier around fetal pain. You are a scientist, and you are a religious person. Do you have any ideas about how we can talk about these things? We know that 73 percent of women who get abortions are religious. In real life, there’s not the opposition that there often is in the public debate. How can we talk of the value of human life, when life begins, and the value of women? How can we talk about these issues so there are some common ground and solutions, not just heat and acrimony? WP: I think you’re on the right path about where we need to go in terms of creating forums and exchanges that lead to light and not heat. My own reconciling [science and religion] has resulted in a harmonious existence. Dr. Martin Luther King Jr. said, Science gives men knowledge which is power. Religion gives men religion, which is control. The two are not enemies. I start with the notion that religion and science answer different questions. Religion answers, oftentimes, “Why?” and science answers, “How?” Sometimes “how” and “why” can blend together beautifully. To have a religious understanding of life and a scientific understanding may on the surface appear to be inconclusive, but they answer different questions. In fact, the best scientists initially came out of the religious tradition. If there’s a dichotomy, it’s a false one. That’s first—I break down that false distinction between science and religion. They are different ways of understanding reality as we know it. Second, in further reading and trying to reconcile for myself these two powerful entities in my life, I came across a sermon Harry Emerson Fosdick preached in 1922 called “Shall the Fundamentalists Win?” He said that for people in the same faith tradition, some can believe quite literally, for example, in the virgin birth and bodily resurrection, while others may not believe that literally but may still value that tradition deeply. [Fosdick] says that we have to break down the distinction that one perspective should rule over the other. If fundamentalists get their way and insist on a very concrete, literal, biblically inerrant approach to spirituality or, in this case, Christianity, they will seek to excommunicate those people who maybe don’t believe in virgin birth but see virgin birth as a way of explaining the unique life path of Jesus. Those aren’t mutually exclusive. There has to be room within the faith tradition for us to be equally committed, to have opposite opinions but to have reverence for the tradition we have in common. I think if we can get people who, again, approach the question of life from a scientific standpoint and people who approach it from a religious standpoint to realize that they are not arguing different points, then that might the beginning of a dialogue. But one of things I do want to avoid in the pursuit of a more civil discourse is the posing of false equivalencies. The notion, for example, that pro-life and pro-choice are equal and different opinions held in reverence and should be respected equally—I think that’s a false equivalency. I think that people who support abortion are also pro-life. Their point of view is the life of the mother. What we can agree on is that she’s female and that she’s pregnant. What the law has decided is that, prior to viability, the state has no compelling interest in forcing a woman to continue her pregnancy. We have to recognize that to equate those two positions is a false equivalency. It allows the media to appear unbiased, but it lends an unnecessary credence and burdens and complicates rather than allowing the facts to illuminate the reality. SS: Well, that’s both knowledge and wisdom. That is both a “how” and a “why,” and it’s very persuasive on some really difficult subjects. We’re grateful to have your insights and your knowledge, as well the good work you’re doing. It’s the intellectual and the spiritual contribution—and then on the ground providing medical services—which is a very rare combination. So thank you very much for taking time to be with us and sharing these good thoughts. WP: My pleasure, Sally. It was a pleasure talking to you. SS: And thank you for your good work. Take care. Sally Steenland is Director of the Faith and Progressive Policy Initiative at the Center for American Progress. You can learn more about this project here.